Manufactured badges are hand embroidered onto the blanket. This 'Spanish Blanket' belonged to a boy called Steve, who was born in 1957 and was a scout in the 1960s. He used this blanket, handed down from his grandfather, to display his collection of patches and badges collected throughout his childhood. 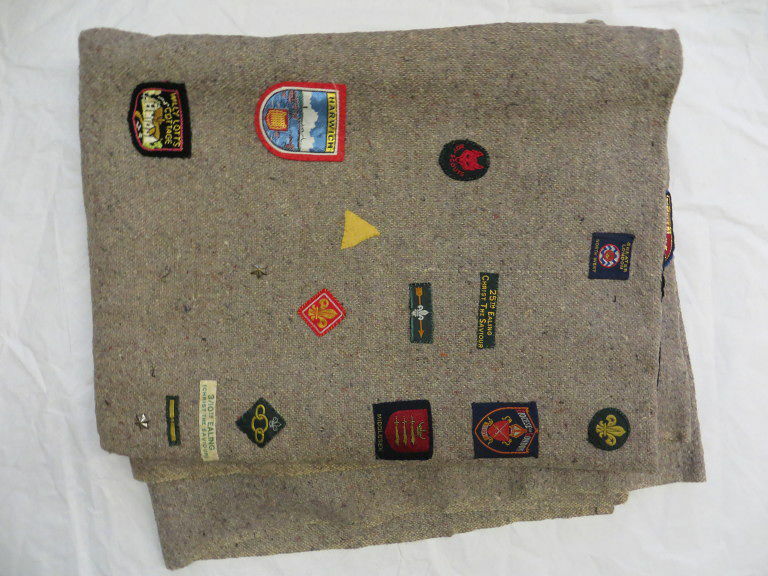 The badges functioned to display Steve's scouting credentials; the blanket, adorned with patches from Wales, Yorkshire, France and London would have been seen by other scouts on camps. The woodpecker badge was swapped with a Girl Guide for one of his woggles. But the symmetrical design also incorporates school badges and football supporter's badges, which serve to position Steve within different groups and affiliations. For Steve, each one is evocative of memory and adventure. A blanket made of rough grey wool embellished on one side with 73 badges of different shapes and sizes arranged in a symmetrical pattern. The badges include three metal stars held on with split pins. The patches include examples from various towns and cities, schools, scout groups, a girl guide group, 1966 world cup mascot Willie the lion, and Chelsea Football Club. The letters 'STEVE' are cut out of blue felt, and underlined with a yellow woven strip. The donor, Stephen (b. 1957) received this blanket from his grandfather, who bought it after the Second World War. It was used on scout camping trips, and has been decorated with badges bought on these trips. One of the badges, featuring a woodpecker, is a Girl Guide's badge that Steve swapped for one of his woggles. Other badges represent Stephen's schools: Westminster City School, Surrey County School, and Christ Church, Ealing. The donor's mother sewed on the badges to her son's designs. The blue felt that used to spell his name was the left over from a chess-board making project, and the yellow woven bands underneath were the coloured strips awarded to Steve when he gained second class rank. Once the blanket was considered too fragile to go on camping trips, it was used as a bedspread. 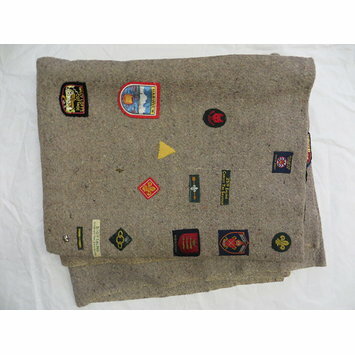 Grey woollen blanket, 1940s, embroidered with collection of patches and badges from 1960s and 1970s.